In addition to consumer related products, we develop highly technical products for medical, government, and other industries. Below is a small sample of these types of products that we are able to disclose. The product is used in factories, together with motors and large machinery. 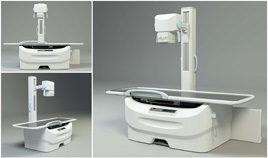 This is an X-ray machine, used in hospitals and clinics for medical diagnosis. The manometer is a medical device used in the operating room during a surgery.